Costumes of Jammu and Kashmir are well known for their embroidery and intricate designs, which reflects the richness of the culture and landscape of the region. The form of clothing is designed to counter the cold climate of the region. Most of the garments are made of wool, silk designed with intricate embroideries and cotton. The traditionally Poots & Pheran is the most popular form of dress among both men and women With Mughal type Turbans, headgear, Taranga Belt of Pashmina and colored scarf. The Pheran is the prominent attire for Kashmiri women. The Pheran worn by women usually has Zari, embroidery on the hem line, around pockets and mostly on the collar area. Ladies prefer suit and Burgha in summer and Pheran are preferred in autumn. The Hindus women of Kashmir wear their Pherans long, stretching up to their feet with narrow sleeves cloths which is turned on the bottom side. Often, the Pherans are wrapped tightly on waist by a piece of creased cloth called Lungi. The Hindu women, started wearing the saree now But as per the culture of the Kashmir region, they have to wear taranga on their marriage day. 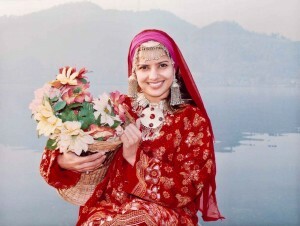 The headdress of a Kashmiri woman is a brightly colored scarf or Taranga, that is stitched to a suspended cap and it narrows down at the back, towards the heels. The Taranga is an integral part of the wedding attire among Hindus. Earrings, anklets and bangles are widely used apart from the use of ornamentation in clothing. Dejharoos or golden pendants (the Kashmiri panditani’s mangal-sutra) are worn by the Hindu women. These Dejharoos comprise two decorative gold pendants which are suspended through gold chains or silk threads. It is symbolic of a woman’s married status among the Kashmiri Pandits. The Pherans worn by the Muslim women are traditionally characterized by their broad sleeves and reach up to the knees. Elaborate Zari embroideries or floral patterns around the neck and the pockets are a prominent feature of a Muslim woman`s Pheran. With Brocade patterns adorn their long sleeves. 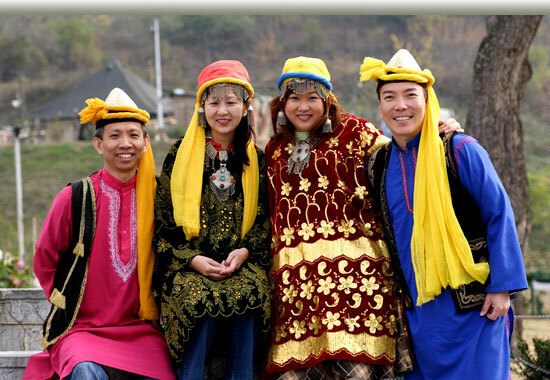 The Pherans are wrapped tightly by a piece of creased cloth called Lungi or Pashmina sawl. They wear a head gear that looks very distinctive from the taranga. The head gear is in red color, they tie it round their forehead like a turban and they also use trinkets and silver pins to tie it tightly. The traditional headgears are made of fine wool and are thick keeping the people warm in the extremities of winter climate in Kashmir. The red headgears known as the Kasaba and abaya. It is worn by the Muslim women as a part of their regular attire, and the Abaya is also commonly worn by them. The Muslim girls who are unmarried, wear the skullcaps which are decorated by the embroidery made by gold thread and ornament it by using trinkets, pendants and amulets. The Muslim women are quite fond of wearing a bunch of earrings. Silver jewelry is popular among the Muslim women and they adorn themselves with neckpieces, bracelets and heavily jeweled chains. The typical dress of a Kashmiris man both Hindu and Muslim is Pheran, a long loose gown hanging down below the knees. The men wear a skullcap, a close-fitting shalwar (Muslims) or churidar pyjama (Pandits). The traditional Hindu male garment pheran is always plain and has narrow sleeves and a left side breast-open collar with a kind of lapel or lace emerging from it. The Pheran is a loosely fitted woollen garment which makes use of the Kangri. The Kangri is an earthen vessel which is filled with flaming coal. The Pathani Suit, also referred to as Khan-dress, is popular among the Muslim men, especially in Srinagar. Turbans are common among Muslim men. Skull caps are prevalent, especially among the peasants and the Karakuli. Fur skull caps with the Pashmina shawls worn by men often symbolize royal lineage. The Muslim men wear lace-free shoes known as Gurgabis. The turban is the traditonal headgear of the Kashmiri Pandit males, though its use is very restricted now. This turban is not much different from the turban the Muslims wear except that the Pandits do not wear any scalp cap inside. The priest class among the Pandits would wear their turbans in almost the Namdhari Sikh style. 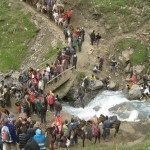 The people who live on the hilly region of Kashmir are known as Gujjars. The women of Gujjar community wear the Kashmir dress which is similar with the dresses of women who live in the Turkish village. The Gujjar women are dressed in loose sleeved tunics (a full skirt) but they like loose sleeves with baggy salwars. They also wear a thick curtain over their face, which is long till their shoulders. The hair of the Gujjar woman, are knotted with more than one plaits, which they like to hang on the front side. 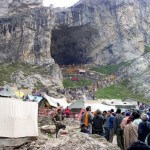 Located in Kashmir state’s mountain valley, on the southern side which is extended till the Punjab’s plains. These people are the existence of the Aryans which normally wear the woolen of grey color and pyjamas which are loose in fitting. They also wear the Kamarband or waist belt. Dogras women wear a loose tunic, dupatta, chudidars salwar and also a cap, which makes their personality charming. Similar Dogara Men wear fitted pajamas and kurtas of considerable length. The use of kamarbands and turban are prominent among the Dogra elders.